NetSuite offers tools to manufacturing companies aid effective planning of material supplies and schedule production to meet delivery timelines. The challenge with scheduling is to balance usability and target achievement. NetSuite’s Production Scheduling solution achieves this balance with a range of features that make it viable to create a workable schedule with minimal time and effort. Real-time scheduling engine: The NetSuite scheduling engine runs in real-time and therefore can schedule work orders as and when they are created or when production reaches a defined status. When the work order with specifications is fed into the system, each operation is scheduled based on the defined parameters. Flexible scheduling code: Flexible scheduling helps manufacturers in staggering production to match the capacities of their machines. This can be done by simply defining the appropriate batch parameters in compliance with the capacity of the machines that run them. Choice of infinite or finite scheduling: Machinery is set up with required variances with finite scheduling to ensure work progresses at a steady and efficient pace overcoming manufacturing bottlenecks as and when they occur. On the other hand, scheduling can be strategized overlooking existing resource load as in infinite planning and NetSuite offers manufacturers a choice of scheduling with user definable constraints based on resource availability and progress of schedules. 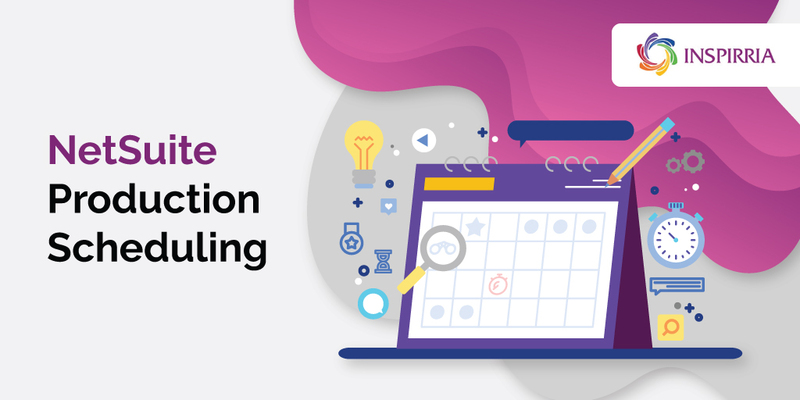 Multiple graphical representations: NetSuite production scheduling features a very useful and powerful view of the schedule called the calendar view. As an easy-to-read screen, the calendar with the work orders depicts schedules to be performed in each work center along with pertinent information such as work order status, availability of hours, utilization percentage and the completed vs planned units. The task scheduler in NetSuite also shows the graphical view of production with the capability to manually drag operations in case there are last minute changes in the production schedule. Get in touch with our consultants to explore NetSuite’s Production Scheduling system for your organization.